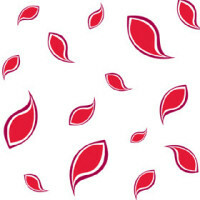 Red Leaves Cellophane Roll 24" x 100'. Perfect for all types of occasions. Background is clear. Perfect for wrapping gift baskets, presents, boxes, use it as a disposable table runner.